Published by The Electric Cooperatives of South Carolina, Inc.
Editorial Offices: 808 Knox Abbott Dr.
You may wish to start here: www.scliving.coop/advertise. Then, please contact Mary Watts, Advertising Manager, by email at mary.watts@ecsc.org, or call (803) 739-5074 for details. We are an NCM member publication. South Carolina Living, the magazine for cooperative members, is published monthly by electric cooperatives to inform readers about their cooperatives, about wise energy use and about the faces and places that identify the Palmetto State. 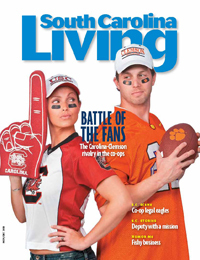 Each month, South Carolina Living brings a colorful mixture of human-interest stories, recipes and travel features to more readers than any other publication in South Carolina.